It turns out that if you like to cook, you have a secret weapon when it comes to making friends in a new city. People like to eat and if you happen to throw say, an ice cream party, and have a bunch of people over to your house and feed them, people will like you for letting them eat good food for free. I made a couple of my favorite frozen treats that you can find on Apples and Butter (lemon thyme sorbet, olive oil gelato and apple pie frozen yogurt) and one new recipe courtesy of Saveur Magazine. If you have made it even just a few pages into the current issue of Saveur (The Greece Issue) then you probably noticed the article on the ice-pop that changed a town in Mexico. We were not changing the social makeup of any town or creating a popsicle diaspora at our party, but the unexpected flavors (at least for American palates) of sweet mango and ancho chile powder did manage to start a few conversations. In other words, they served as the perfect icebreaker. If you like the idea of salty and sweet combinations, then this combination of spicy and sweet won’t be too much of a reach for you. If it seems a little daunting, cut back on the amount of ancho chile powder so that the spiciness is more of an aftertaste. I will be making these again exactly as Saveur suggests. I think the recipe is perfect as is. Heat mango juice, sugar, lemon juice and water in a medium saucepan over medium heat until the sugar dissolves. Chill mixture in the refrigerator. Stir in the ancho chile powder and mango chunks. Transfer mixture into popsicle molds of your choice and freeze until solid. I expect we're going to be seeing a lot of ice pops in coming summers. Mango and chili sound like a great combination! Where was I when you threw this party? I would have loved to bite into this treat. I've had mango chili lollipops from Mexico. They were painful to eat, yet addictive. My husband is from India -- he loved the lollipops and thinks they'd do well in India, another land of chiles and mangos. Beautiful! Will have to try them. Hmmm ... I have a watermelon sitting in my frig waiting to be turned into a tasty, beautiful, delectable ... something ... I think your mango pops gave me a good idea for that watermelon, too. P.S. Did you make the olive oil gelato, or get it from Otto (or another place)? My Green Mouth - I made the olive oil gelato, but it's from one of Batali's cookbooks so it's the same thing (or as close as I can get it) to the one they serve at Otto. I tracked down the recipe after eating the gelato at his Mozza restaurants in LA. If you follow the link in the post, you'll find the recipe from the first time I made the gelato. Enjoy! An ice cream party certainly does sound like the perfect way to make lots of new friends. 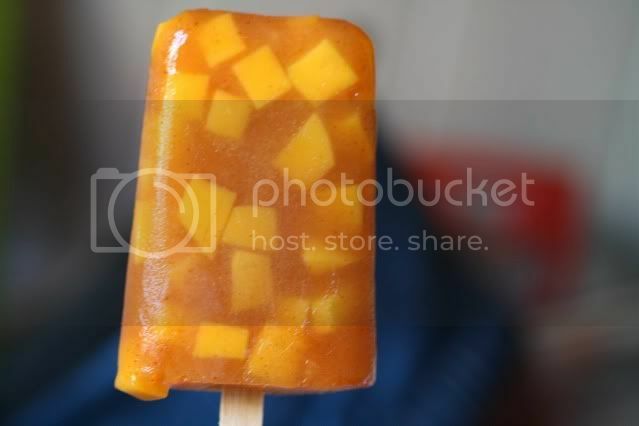 What a beautiful mango chilli ice pop. The chunks of mango inside are very inticing. Sweet hot is my favorite flavor combo so I love the idea of mango and chili. Yum. And I bought a set of the good popsicle molds so I'm definitely going to try these. wow,i want to eat.must delicious.